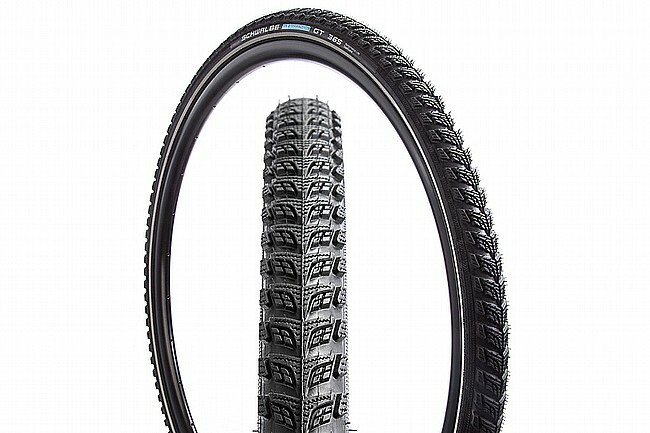 With the Marathon GT 365 26" Tire, Schwalbe set out to create the first tire that can be used safely throughout the year in just about every condition. Featuring a new versatile tread pattern, an improved rubber compound, and Schwalbe's puncture protection technology, you can be sure this tire is ready for the worst that Mother Nature can provide. Featuring the new Lamella tread pattern, this tire features the perfect combination of deep-grooved aggressiveness, a fast-rolling center patch, and blocky shoulder tread allowing this tire to find traction in everything from pristine black-top, wet bike paths, or wintery-mixes over a variety of terrains. Complimented by Schwalbe's new "FourSeason" compound, this new rubber provides full grip no matter the time of year or presence of asphalt. I use my bicycle to commute to work year round and the regular Schwalbe Marathon 26 x 1.75's do not feel steady on snowslushy pavement. I've been riding Schwalbes for years but not during the winter. So instead of some other brand knobbies, this winter I bought the GT 365's. Love 'em. Enough knob for good grip, but not too much that would cause noise rolling resistance. Highly recommend. And if they wear like there fair weather cousins, I'll be riding these for many winters to come.